Microsoft's Windows 10 Mixed Reality efforts are on a bit of a roll lately, thanks in no small part to its various partners showing off new headsets and some even opening up pre-orders. At the event, our invite says, Microsoft's Alex Kipman "will elaborate on our vision and showcase our final Windows Mixed Reality experience coming this holiday to Windows 10 PCs." Kipman is the voice of mixed reality at Microsoft, taking the stage at various events to wow the crowd with realistic, computer-generated demonstrations. He's also the inventor of Kinect and HoloLens, so he certainly knows a thing or two about MR. Chances are we'll get an update on these headsets, and possibly some new ones, during the October 3 event. Microsoft may announce new content partners following the news SteamVR and Halo are coming to Windows Mixed Reality. Having good content is crucial to customers buying into the ecosystem. 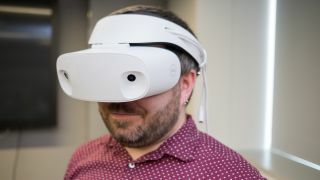 What we won't see at the gathering is HoloLens 2, according to The Verge. It may be two more years before we see an update to the impressive, though expensive visor.